The Hotel Quirinale is a large four-star hotel which is conveniently-located on a major shopping street not far from Rome's main railway station, Stazione Termini. It is a decent and comfortable place to stay and is popular with tour groups. It is less cramped and more like a traditional hotel than much of Rome's accommodation, but some areas are slightly tired. I stayed at the Hotel Quirinale in February 2007, booking a double room ('Business Double') online, where I found quite a reasonable rate: €310 for two nights. Unlike many Rome hotels, which have cramped public areas and anonymous entrances, the Quirinale is an 'occasion' hotel, and will feel more familiar to overseas travellers. The reception area is large and imposing, with several reception staff and a concierge to offer advice and assistance. A spacious public bar features a piano and well-spaced seats and tables, where little cards give you the option to request a song from the resident pianist. This made a comfortable place to sit with a hot drink and snack and work using the hotel's wireless network (run by an independent company, with low prices) while waiting for my flight. My bedroom was approached via long and rather weary-looking corridors, with faded carpets and a stink of cigarette smoke around a service stairwell. Not at all a four-star experience, but my room, when I reached it, was a pleasant surprise, with an old-fashioned and comfortable feel. The door opened onto a small lobby area with separate doorways leading to the bathroom and bedroom. Disconcertingly, there was a locked connecting door from my lobby to the adjacent bedroom - useful for guests with families but rather more intimacy than one would choose. Furniture and facilities included a large, high and firm double bed, bedside tables, a desk, chairs, a mini-bar, a suitcase alcove/stand in the lobby area with coat-hooks, a wardrobe with a safe (I had to ask for the key at reception), a television set and a keyboard for fairly expensive TV internet access. The bedroom window looked over the hotel's courtyard/garden, away from the noise of the street. I quite liked the grand old air and the castle-like bed; my only real fault with the room was the lack of an electric socket to charge a phone or connect a laptop - in the end I had to move the mini-bar and unplug the TV. This is a common problem in Italian hotels, where electrical fittings are often antiquated and hanging from walls, and it would be nice to think that four-star hotels would improve their wiring and coverage in these switched-on times. The bathroom was very smart with marble walls and floor and grand fittings. There was a massive bathtub with feet - an unusual find nowadays, when showers have generally replaced baths in Italian hotel rooms. There was a shower overhead for those who prefer not to linger, although it did lead to the risk of floor puddles. Disappointingly, the bathtub was not scrupulously clean. The free toiletries were a decent selection. Breakfast wasn't a particularly pleasant experience. It was flustered and crowded. I had a long wait to be seated and wondered if I was overlooked because I was alone. Service was off-hand: a waitress flicked crumbs off the tablecloth after I'd sat down, and I was rather taken aback when she seated another couple at my table without a by-your-leave or acknowledgement. My fellow-guests were pleasant company but were as surpised as I at the standards of service. There was a scrum for the buffet, and I had to make many journeys to collect my own teapot, teabag, water and add milk direct from a dispenser. The range of food was the usual Italian breakfast buffet fare: dryish cake, tinned fuit, yoghurts (only banana), croissants, bread and that watered-down fruit juice. Less typically, the hotel did offer heated scrambled eggs, ham and sausage slices. On my second morning I had an even longer wait, despite empty tables, and actually had to be pushy to get seated, after being queue-jumped by other guests, and then had problems defending my place while absent at the buffet table. I suspect that the dining experience may be much more comfortable in summer months when the hotel's outdoor garden terrace is presumably opened to allow more space. The Hotel Quirinale is located on Via Nazionale, a wide and busy street on many bus routes. This a good place for shoppers, with lots of high street stores including some affordable and useful shoe shops. It is close to the Teatro dell'Opera, and many of Rome's sights, including the Vittoriano monument and the Forum and Colosseum area, are in walking distance. The centro storico (historic centre) is a little further but still reachable on foot (though personally I would normally save energy by catching a bus). Address: Via Nazionale 7. The hotel is just down the road from the Repubblica metro station. This is one stop from Stazione Termini, Rome's main railway station (or a short walk). The hotel is a decent and well-located place to stay, and convenient for travel connections. It has a layout and atmosphere with a reasonably international feel, though without the modernity and slickness travellers may hope for. It would be quite a comfortable base for traditionally-minded tourists and for family groups. It's not my favourite Rome hotel - not enough atmosphere, no special feature that would give it a boost - and breakfast was disappointing, but I would still return. 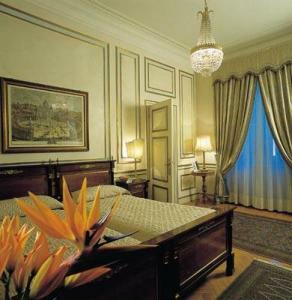 Hotel Quirinale review by Italy Heaven editors.